Warm weather, the smell of fresh-cut grass and more daylight hours – all great benefits of the arrival of spring. But, for dads, perhaps the best aspect is that it gives you a chance to get your kids out of the house (and out of your hair). 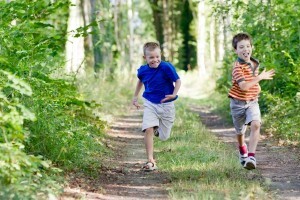 Let them burn off their energy in the great outdoors to keep them engaged during the day and sleepy at night. With that in mind, here are a few tips on how to entertain your kids when you head outdoors. 1. Fishing. It may not seem like the most exciting activity to your youngster, but what better way to teach them the importance of patience than a day out on the lake? While you may not even catch anything, wiling away the hours out on the lake will get you some quality time with your son our daughter and get you out of some household chores. 2. Ride bikes. Training wheels or no, taking a ride around the neighborhood is good exercise that can turn into an adventure of sorts. Taking your kids to places heretofore unexplored can be exciting for you as well. 3. Wiffle ball. That age-old spring-time tradition never goes out of style. With nothing more than a plastic bat and a ball, you and your kids can enjoy the early-evening warmth together (maybe you'll discover one of them has athletic prowess you never did).